Tripura is situated in the north eastern part of India. It is one of the oldest states. In Tripura, most of the part is hilly and there are several deep river valleys. In mountain region, there are thick forests and extensive bamboo groves. 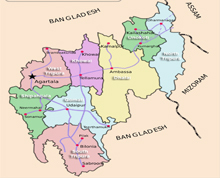 The state capital is Agartala. Tripura It is bordered on the north, west, south and south-east by Bangladesh whereas in the east it has a common boundary with Assam and Mizoram. Click here for maps. Historians and researchers have lots of confusion to explain the origin of Tripura. According to the 'Rajmala", Tripura's celebrated court chronicle, an ancient king named 'Tripur' ruled over the territorial domain known as 'Tripura' and the name of the kingdom was derived from his name. A school of historians, however, challenge this story and identify 'Tripur' as an imaginary and a historical character. Many researchers explain the name 'Tripura' from its etymological origin: the word 'Tripura' is a compound of two separate words, 'Tui' (water) + 'Pra' (near) which in totality means 'near water'. The geographical location of the state is such that it is close to the enormous water resources of Eastern Bengal (present Bangladesh).